In this section you’ll find articles, podcasts and courses to make the home we live in as low tox as possible. That means everything from where we may find phthalates in our home environments and how to reduce our exposure, right through to choosing a piece of furniture or mattress. Go Low Tox is the course you want to do to dive deep into this topic and get completely across it, but if you’re not ready to jump in yet, we have lots of resources in this section to help you along the way. Enjoy! Want to find all the podcast shows we've done on the topic of HOME? Click through HERE for easy navigation. More resources on the HOME can be found HERE: Alexx's how-to's and lifestyle articles and HERE: DIY recipes (cleaning and personal care). 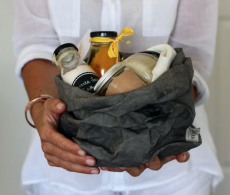 Low Tox Loving "Back to school"
Plastic free July - do it! It's time. There’s WHAT in my candle? Where copycat chemicals lie so you can say buh bye!